Soundtrap is a free web-based tool, which allows to let students to record audio, both from the computer's microphone, external instruments and from a variety of electronic instruments. It is also possible to import audio files into the tool. Soundtrrap allows students to work individually with audio production, and for them to collaborate online on a common audio production. It is suitable primarily for use within the dialogical and the polyphonic form of teaching. In the dialogical form of teaching Soundtrap can be used as a tool for students' individual production of sound-collages and music, and it can be used in pronunciation excercises in language teaching. Another possibility is to use Soundtrap in relation to reading aloud. Within the polyphonic form of teaching the tool can be used for many of the same activities, but here the option of online collaboration in real-time will be in focus. Students can record different tracks in a project, and edit each other's tracks. Soundtrap provides both the ability to record sound in a simple version (Easy mode) and in a more advanced version (Pro mode). At first, most will probably be plenty challenged in Easy mode, but when adding effects to reading aloud or recording music, there are plenty of exciting options in Pro mode. To use the Soundtrap requires that one have an account. Such can be created on the frontpage, where you. have the opportunity to create it with an existing Facebook or Google account. It is free to use Soundtrap if you create no more than 5 projects. If you need help getting started using Soundtrap, there is help to find in these tutorials for Soundtrap. Flippity provides the ability to create sets of ' flashcards ' around a Google spreadsheet. Flippity can be used in exercises that develop students' conceptual understanding, and is particularly suitable for use within the monological and the dialogical form of teaching. In the monologic form of teaching, Flippity can be used to train and test students in their understanding of different concepts. The teacher can, after creating a Google Spreadsheet with pair of terms, share it and import it to Flippity. It is possible to add photos and Youtube videos on a flash card, simply by putting the link to those in the cell in the Spreadsheet, that is corresponding to one side of the flashcard. At first, you must copy a template into your Google Drive. It only has to be done the first time you create flashcards, and only requires that you click here. After filling in the spreadsheet you have to share it, and then copy the link to it in the box at the bottom of this page. This will open a page with the set of flash cards, and you can share this page with your students – either by sharing the URL or by generating a QR-code. Within the dialogical form of teaching you can let students develop their own flashcards, where they define various words and concepts within a topic. Students can then share their flashcards with other students, which allows for Flippity to be used as small training games. 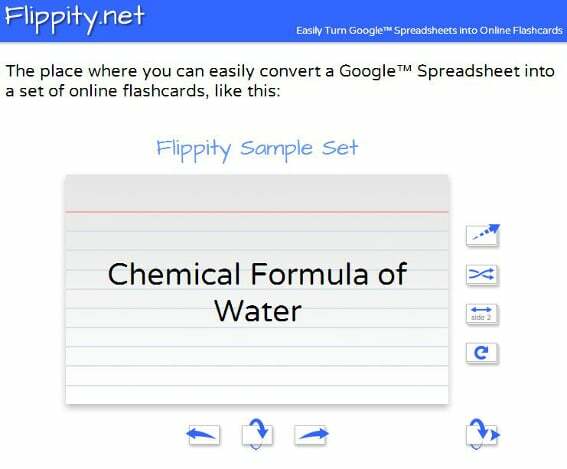 It's free to use Flippity, but it requires that you have a Google Account, in order to create your flashcards in a Google Spreadsheet. If you need help getting started, you can read this Guide to Flippity. MindMup is a free mind mapping tool, which allows you to collaborate online on a shared mind map. Where Mindmeister requires that you create an account, you can use MindMup and store your maps offline without creating an account. MindMup is primarily suited for use within the dialogical or the polyphonic form of teaching. Within the dialogical form of teaching MindMup can be used as students' tool to generate ideas and organize information. It could be in connection with the tasks they have been asked by the teacher. Students can use MindMup without creating an account, and they can save their mind maps in the browser's memory, and work on them later. Within the polyphonic form of teaching MindMup can be used by students to create shared maps for generating ideas when solving group assignments, project work and similar tasks. Students can, simultaneously, enroll their ideas in the mind map and they can build on each other's ideas in real-time, and the teacher also has the ability to read and participate in the evolvement of ideas. An online mind map can also serve as a tool to manage the collaboration process between a group of students. If you wish to use MindMup's opportunities for collaboration, both between students within the polyphonic form of teaching, and between the teacher and the individual student within the dialogic form of teaching, You must activate the extension realtime collaboration under ' Extentions ' in the menu bar. In order to enable this extension you are required to, linking MindMup to your Google Account. This also provides the ability to store maps on Google Drive. You can read more about the possibilities of online collaboration in this Guide to MindMup. VideoNot.es is a free tool which allows you to take notes while watching movies. 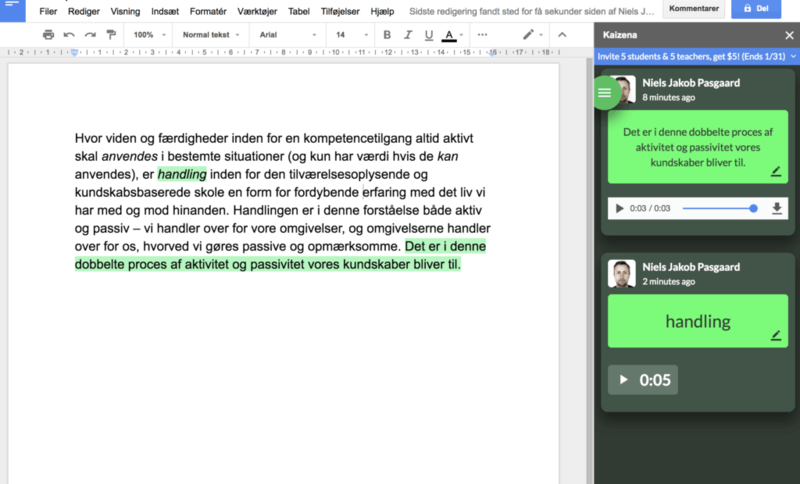 The tool is integrated with Google Drive, and is primarily suited for use within the dialogical form of teaching. Within the dialogical form of teaching it is natural to let students use VideoNot.es as a note-tool while analyzing a movie, commercials and music videos. 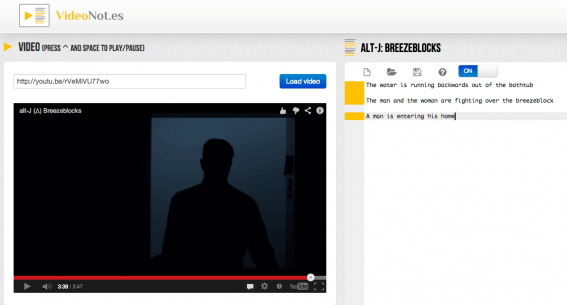 The tool can show movies from YouTube, Vimeo and Coursera, and they are easily imported into the tool by simply entering the link for them. It is possible to take notes in the field to the right of the movie window, and the notes are automatically synchronized with the moment in the movie that they are posted at. By clicking on a note, one can jump to that point in the movie, and one gets a good overview of the notes relation with the story of the movie. VideoNot.es is integrated with Google Drive, and one must therefore have a Google account to use the tool. Such can be created here. Integration with Google Drive makes it possible, to save the notes directly into Google Drive, and share them with others by using the ' Share ' button in the upper-right corner of the note-area. By setting VideoNot.es as the default app for opening video notes in Google Drive, the one you share them with can see both the movie and its synchronized notes. It is easy to use VideoNot.es, and the first time you log in, you get a short, introduction, of the basic features of the tool. VideoNot.es is also available as an App for the Chrome browser. Scoop.it is a so-called curation tool. To curate means to 'select and sort'. With Scoop.it, you can easily curate articles and websites for students on specific topics, and you can let students comment on the articles. Scoop.it is suitable primarily for use within the monological and the dialogical form of teaching. Within the monologic form of teaching, Scoop.it can be used to distribute articles on different subjects to students. You can create multiple boards (topics), so you can create one for each subject. Scoop.it allows you to enter keywords, and you will be able to find suggestions for news articles, which may be relevant. You can also follow other users of Scoop.it, such as colleagues, and're-scoope ' the articles they have shared. Articles can also be saved to a board with Scoop.its 'bookmarklet', which functions as a button in the favorite line of the browser. If you come across a relevant article online, one can easily ' scoope ' it to its board by using bookmarklet'en. Within the dialogical form of teaching Scoop.it can be used as the students' problem-solving platform. When the teacher adds an article to her board, she can add a comment to it. It could for instance be in the form of questions related to the article. Students can then add their answers to the questions in the comments to the article, and they can comment on each other's answers to the questions. There is already a lot of ​​Scoop.it boards, it may be interesting to follow. 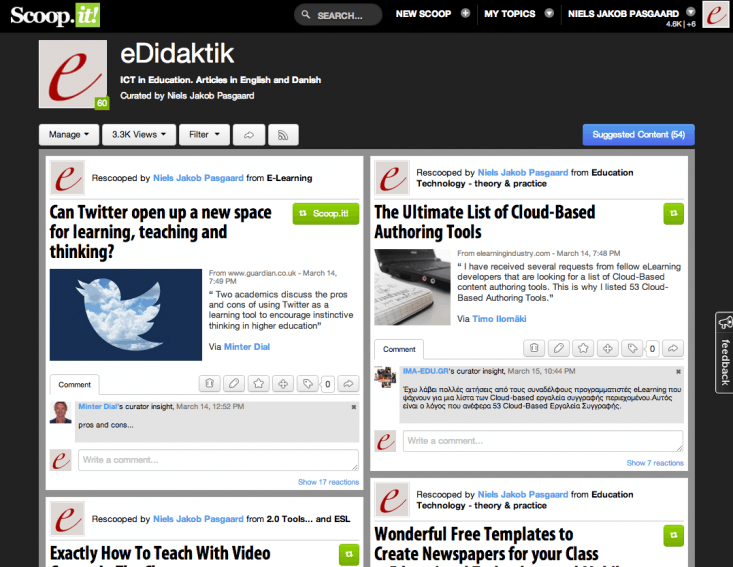 You can take a look here, and you can also find eDidaktik on Scoop.it. Scoop.it is free to use if you do not have more than 5 boards, and requires only, that you create a profile at the top of the page. You can log in with a Facebook, Twitter or LinkedIn account, and it is also possible to create an account with an e-mail adress. If you need help getting started with Scoop.it, there is help and instructions available here. 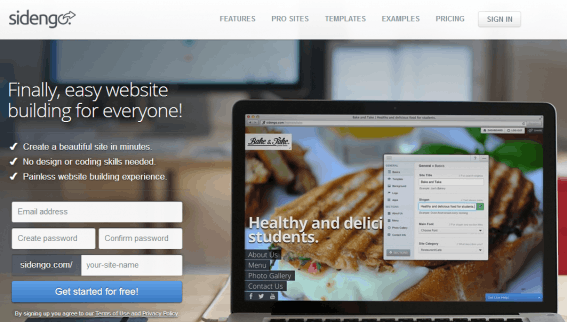 Sidengo is a free tool for producing and publishing websites. With Sidengo it is quick and easy to create a website for a class, or to let students create their own websites. Sidengo is suitable for use within the monological and the dialogical form of teaching. In the monologic form of teaching, Sidengo can be used to inform students about professional subjects or to distribute practical messages. The teacher can post articles, videos and documents on the webiste she has created in Sidengo, and it can function as the teachers' distribution platform. In the dialogical form of teaching Sidengo can be used as a platform for students' productions. The students' media- and text productions can be posted on their individual websites, and by using the same website over time, it may function as the student's personal portfolio. It is easy for students to import media from services like SoundCloud, Vimeo and YouTube. Sidengo is free to use, and requires only, that you create a profile here. If you need help getting started with Sidengo, you can find it here. MapBox is a free service, which lets you create maps and allows you to insert markers with text in the map . MapBox is suitable primarily for use within the dialogical form of teaching. Within the dialogical form of teaching MapBox can for instance be used for field trips. The teacher can create a map and set markers at specific locations, which students must pass on the excursion. In the map below, I have inserted three markers on a map of Aarhus City, Denmark, and given the students a task on each location. It is also possible to let the students create their own maps, and to allow them to insert markers with information on different locations. Used in this way, MapBox can help prepare students for a field trip. One can for example have the students work in groups to find interesting locations in the city they are to visit, and then let the groups exchange maps to allow the students to explore the city using the map that another group has made. 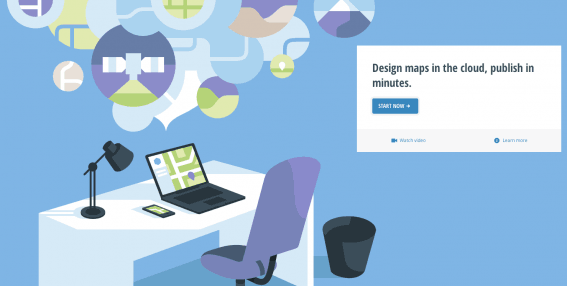 To use MapBox you need to create a free account. Such can be created here. A free account lets you create an unlimited number of maps, but they are limited to be viewed 3.000 times. You can upgrade for $5 a month, which gives you 10.000 map views per month. You can share maps by embedding them as I have done above, and as normal images, or as a link. If you need help getting started using MapBox, you can read a guide here. ThingLink is a free web-based tool, which allows for the creation of interactive images. The tool allows both teacher and students to tag specific spots in an image and to embed links, sounds and video, to create visual information- and link collections. ThingLink is primarily suited for use within the monological and the dialogical form of teaching. In the monologic form of teaching, the teacher can use ThingLink to present materials to students. For example it is, in preparation for excursions, possible to create an image of a map of the area or town you are visiting in Thing Link, and highlight the main points of interest on the map, and then embed links to pages and articles with further information on the various points of interest. You can also add audio recordings to an image by using SoundCloud, and you can embed the ThingLink images on a website, as I have done above (hold your mouse over the image to see the nested tags). Within the dialogical form of teaching students can use ThingLink to gather information on specific topics. The tool can be used for brainstorming, but it is also a great tool for image analysis, where students can put comments in various places in the image (in the same way as in Live Minutes), and where they can link to other people's texts on specific elements of the image. You have to create a free account to be able to use ThingLink. The account can be created using an existing login for Twitter or Facebook, and allows you to upload up to 100 images. If you need more than that, you can upgrade for $5 a month. If you need help getting started using ThingLink, help is available on the website here. 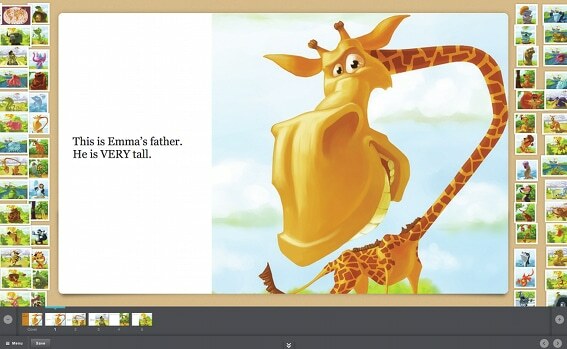 Storybird is a free web-based tool, which allows you to let the students write stories based on pictures. The tool allows students to work alone on writing texts, and to work together on a common history. It is suitable primarily for use within the dialogical and the polyphonic form of teaching. In the dialogical form of teaching Storybird can be used as a tool for students' creative work. The teacher can create and organize students in classes in the system, and can then ask them to solve a common task, which is based on a picture. It is possible to upload a photo from your own computer, as a basis for this sort of writing task. You can also let the students create their own stories in Storybird. For such more free writing tasks, the many pictures in Storybirds database can serve to inspire the students. The student chooses a picture in the Storybird collection, as the starting point for the story, and then builds a story around a series of images, which relate to the first selected image. It is possible for students to write part of a story in Storybird, and share it with someone else, who can then continue writing on the story. This feature is well suited for use within the polyphonic form of teaching. Students may for example be organized in pairs, and alternately write two different stories. This gives both the opportunity to inspire each other in the writing process, and it becomes possible for the students to edit, what the other has written. To use Storybird one must have an account. Such can be created here. In order to be able to create classes and make common tasks for students, one must create a Teacher/Class Account. The teacher can very easily create students as users, so they can begin to write stories immediately. It is free to use Storybird, if you don't create more than 3 classes and 75 students. If you need help getting started using Storybird, it can be found here.